The Doubtful Official! "Rylan's reputation is his first line of defense, and his perfidious allies last. " Thanks to the figure of Lieutenant Rylan Olliven, an atmosphere of corruption reigns in your parts of Descent: Travels in the Darkness! This Lieutenant Expansion also contains the Intrigued Interior Plot card deck, as well as Threat Tokens, to give the Evil Lord new options and allow him to recruit the Machiavellian Rylan Olliven into the Descent Campaigns: Travel in the darkness. Be careful this game is an extension of Descent: Voyages Dans les Ténèbres (Seconde Édition) and cannot be played alone. 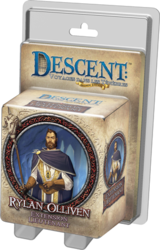 To be able to play it you must have a copy of the game Descent: Voyages Dans les Ténèbres (Seconde Édition) .